I suppose the best I can say is that it seems to take the edge off. What I wanted to find out was what kind of impact the legislative session (hundreds of lawmakers, staffers and policy wonks coming to Olympia and Thurston County for at least two months every year) has on our economy. You could easily assume that it has some. When people are in town for session, they have to eat, pay rent, entertain themselves and (I suppose) shop. Even just the work of lobbying, taking lawmakers out to eat, has to produce some economic benefit. So, the best indicator I could find for economic activity by date was retail sales tax paid in each quarter. You can find the data I used here. Here are the spreadsheets I used. First, I took all retail sales tax paid in the four quarters between 2005 and 2012 averaged out. I compared Olympia, Lacey and Tumwater with Bellingham. I used Bellingham as a stand in for a similar community to Olympia that doesn't have a seasonal political population. You can see a similar curve across both communities. Economic activity rises through the year, dropping back down each first quarter. The curve from low activity first quarter to higher activity through the fourth seems to indicate that in terms of the broader economy, the legislative session doesn't have much impact in Olympia. Despite the people visiting and temporarily living here for a few months, the economy here (which is still supported by the broader government) is too large to really for use to really see the impact of session. But, if you take a closer look at just one aspect of the economy here, say food and lodging, you start to see some sort of impact. The chart below shows just the sales taxable activity in places like restaurants and hotels. Again, you see a similar curve in both urban Thurston and Whatcom counties. 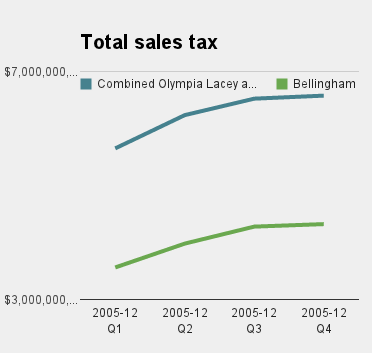 But, the Olympia, Lacey and Tumwater curve is less pronounced, especially in terms of the first quarter. 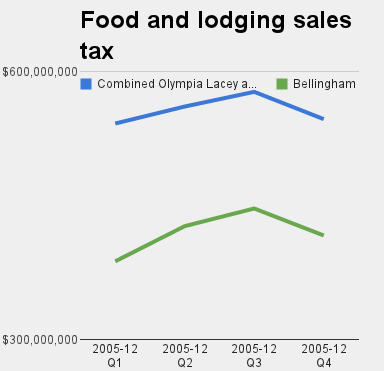 You could almost say the session (which would increase spending in the first quarter) takes the edge off lower first quarter spending on food and overnight rooms in Olympia. Still though, even this kind of spending in the average first quarter isn't as high as the third quarter. So, while there's some benefit, it still seems smaller than what people often imply it to be.